Swiss ophthalmologist, born 19th April, 1850, Wülflingen, Canton Zürich; died 1931. Haab's lines = horizontal breaks in Descemet membrane occurring in congenital glaucoma. Otto Haab was educated in Zurich and received his doctorate there in 1875. Already the previous year, 1874, he was assistant to Carl Joseph Eberth (1835-1926) in pathological anatomy, in 1877 at the ophthalmological clinic under Johann Friedrich Horner (1831-1886). He was habilitated for ophthalmology in 1879 in Zurich. 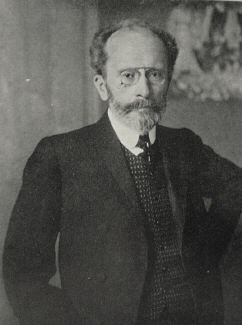 In 1886 Haab succeeded Horner at the University of Zurich, remaining in this position until 1919. His written work concerns a wide spectre of ophthalmological themes. He contributed in particular to the knowledge of the pathological anatomy of the eye, operative ophthalmology and in particular the treatment of lesions of the eye. He introduced the giant magnet in eye medicine. Besides the works mentioned below, Haab contributed to various textbooks of ophthalmology. In Ziegler’s Lehrbuch der pathologischen Anatomie. Atlas und Grundriss der Ophthalmoskopie und ophthalmoskopischen Diagnostik. Munich, 1895. 5th edition, 1908; translated intoEnglish and French. Atlas der äusseren Erkrankugen des Auges nebst Grundriss ihrer Pathologie und Therapie. Munich, 1899. 4th edition, 1910; translated into English and French. Das Glaukom und seine Behandlung. Slg. Abh. Augenheilkunde. Halle 1902; 4: H, 6, 7). Atlas und Grundriss der Lehre von den Augenoperationen. Munich, 1904. 2nd edition, 1920; translated into English and French. Das Werk von professor Dr. Otto Haab. Basel, 1931.